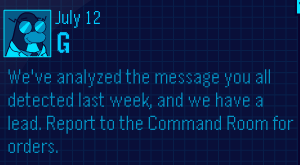 If you check your Spy Phones you will see that Gary has sent you an EPF message! It is a bit similar to what he sent last week. 'We've analysed the message you all detected last week, and we have a lead. Report to the Command Room for orders.' Do you think we will find Protobot? Leave a comment and let us know!